While the quality of the flowers in your exhibit weighs heavily with the judges, their decision is also influenced by seemingly trivial factors, such as cleanliness of the plant’s foliage and its container, freedom from insect pests such as scale and aphids, and the manner in which the inflorescences are staked. 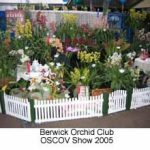 Preliminaries such as these can make the difference between first or second prize, even Champion and Reserve Champion orchid or display! 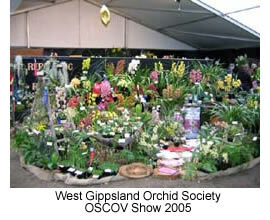 Here are some tips for preparing your orchids for a show. Preparing Your Plants. 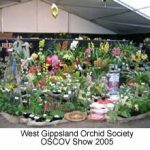 On the day before show set-up, give all your plants a good soaking and top dress their pots with moss if the show is to be held in an air-conditioned shopping centre, where the atmosphere is very dry. Clean each pot thoroughly, or place it in a slightly larger new pot. Some exhibitors place a layer of damp moss in the outer pot; this helps to prevent the exhibit becoming dry during the show. Clean the foliage with a clean tissue damped with water or with diluted milk, which leaves a slight gloss on the leaves. Don’t use white oil, which makes the leaves unnaturally glossy. Trim burnt or damaged leaf tips; however, don’t cut them straight across but shape them to match the undamaged tips. Check that your inflorescences are staked and tied to display their blooms to best advantage. Make sure that all the stakes are of the same diameter and colour (preferably an inconspicuous green), and that the ties also match each other and are as inconspicuous as possible. Never use more ties than necessary. Prepare your plant labels carefully. Check the schedule to ensure that you use the specified size and colour. If no colour is specified, then you may choose your own. Many exhibitors use white card and a black pen but green card is less conspicuous, while black is even less so, although then you will need to buy a silver or white pen. Print the correct name neatly, making sure that it can be read from a distance of two metres. Your label may also need to show your exhibitor number, a plant number and also a coloured disc if you need to nominate your plant as, for example, a novice exhibit or a seedling flowering for the first time. Finally, make sure that your label is placed on the plant in such a position that it clearly indicates the flowers to which it applies. Often this aim is better achieved by fastening the label to a separate stake than to the foliage – labels attached to the foliage sometimes ‘disappear’ beneath other leaves. Transporting Your Plants. Before loading your plants in the car, pack the inflorescences with soft tissue paper or florist’s wrapping paper to minimise chafing by leaves etc. Use temporary stakes to support arching or pendulous spikes and wedge the pots into foam fruit boxes to prevent them falling over when you ‘hit the brakes’. On arrival at the venue, don’t forget to remove all temporary stakes, tissue paper and other grooming materials. Then label all your plants, especially if you are building a display (the back row can be very hard to reach after the display is built!). Building a Display. 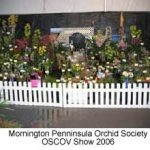 Aside from expressing yourself creatively and artistically, building your own display allows you to display your plants to their best advantage, often providing you with a distinct advantage over orchids placed on the club stand. However, you need to use forethought – row upon row of supermarket shelving filled with crowded plants lacks imagination and will not impress the judges. Make sure that your best plants stand out from their neighbours. Relate the size of each exhibit to the optimum level for viewing it. 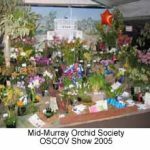 Small orchids such as masdevallias or slippers should never be placed on the floor – judges on their knees are not a pretty sight (especially from the rear) and the extent of their grovelling may be reflected in your level of success! The show schedule may allow for theme displays. Use your wit and ingenuity. Props such as ladders, wheelbarrows, hat racks and pipes standing on end are sometimes used to advantage. Carefully plan the best location and height for your feature plants and give thought to their most suitable neighbours. Prefabricated shelving and supplies of foam boxes and empty pots of various sizes are useful to adjust the height of various exhibits. Neutralise the background with a drape in green, black or earth colours. Cloth, paper, hessian moss, wood chips, plastic sheeting, foliage plants or ferns are often used for this purpose. Finally, consider the use of a formal boundary to frame your display. 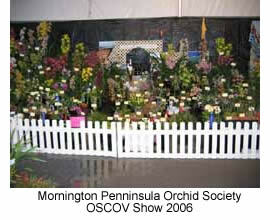 Some exhibitors use a low fence, which also serves to protect their plants from members of the public. 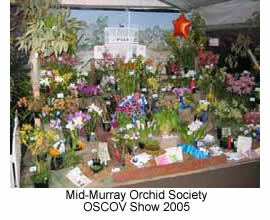 A well designed and cleverly constructed display will add another dimension to your orchid hobby. Judging Your Display. 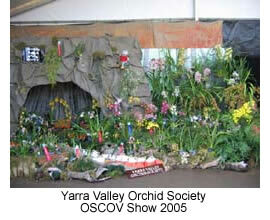 In assessing your display, the judges assign points for quality (35), design, creativity and colour (35), technique, finish and labelling (20) and variety (10). 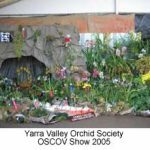 Quality is not necessarily determined by the total number of prize ribbons, as any ‘dogs’ (inferior orchids) present will detract from the prize winners. Aim for overall high quality. Design refers to the form and artistic arrangement of the display, creativity to the aesthetic expression of this concept and colour to the placement of plants for the most pleasing overall effect. Technique refers to the mechanics of construction and plant placement, finish to the overall completeness of the display and labelling to the neatness, legibility and accuracy of the labels. Variety has replaced the old genus count. 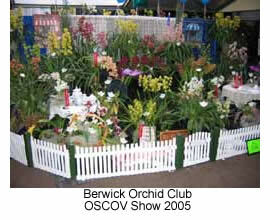 A display of standard, intermediate and miniature cymbidiums, including arching and pendulous as well as upright inflorescences, may score as well as one with seven or eight different genera. Always take a photograph of your display when it is complete – in the future it will recall fond memories, as well as helping you to plan an even better display next year. Good Luck at your next show.